Angie's Adventures: Recycling Returns to South Main Neighborhood! EXCITING NEWS: Recycling has returned to South Main. And the best part is you don't have to sort anymore! All the items can go into one bin together. Recycling downtown is now fast, easy, and convenient! Early last year, downtown Memphis residents used recycling bins that were sponsored by the City's Office of Sustainability. Unfortunately, funding for the bins ran out and they were removed. 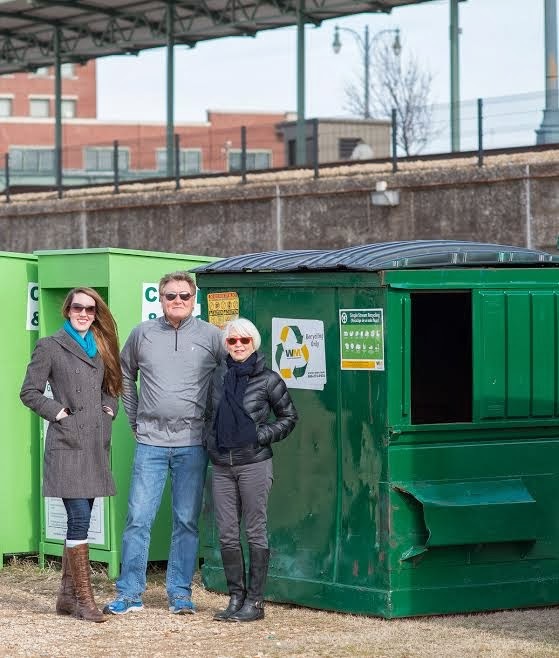 Rather than lose them for good, a small group of downtowners including me, Sharon Leicham, and Bob Lundy worked together to come up with a plan to bring recycling back to South Main. And, the Office of Sustainability helped to connect us with the right resources to get started. We toured the single stream facility at ReCommunity, and put together a campaign to raise awareness and funds. Thank you to the generous donations of our friends and neighbors downtown, we were able to raise over $1,200. Then, the Downtown Memphis Commission stood up and matched that $1,200! The South Main Association has also jumped in to to help out. They are now our non-profit sponsor, helping us manage the relationship with recycling pickup company, Waste Management, and recycling facility, ReCommunity. The "single stream" bins allow you to quickly and easily throw all of your recyclables into one container. No more sorting will be necessary. Recycling has just gotten faster, easier, and more local thanks to generous donations by the Downtown Memphis community. THANK YOU to everyone for all of your donations, and for spreading the word about our project. But, to keep recycling in South Main for good, we will continue need your support. To learn more or to make a donation to this exciting initiative, visit us at Facebook.com/SouthMainRecycles or Fundly.com/south-main-recycles. Please help us spread the word that RECYCLING IS BACK IN SOUTH MAIN!